The start of the baseball season is less than a month away. Every weekday until opening day, we'll be counting down, from No. 20 to No. 1, the most important Mets players for the upcoming 2010 slate. Today, No. 8, starting pitcher Oliver Perez. ... Oliver Perez struck out more batters per nine innings last season than all but seven pitchers in the history of baseball. It's no surprise that Randy Johnson heads this list ... I tell this to pessimists who start comparing Perez to the likes of Kris Benson. Perez is a wunderkind; Benson is a 30-year-old prospect ... More comparisons to [Mark] Prior, [Pedro] Martinez or Johan Santana could be made, but let's end instead with another lanky left-hander who had a much closer career record to Perez at age 22: Sandy Koufax. Yeah, that didn't happen. Perez instead has turned into this Oliver Perez: A 28-year-old wild thrower whose undisciplined work ethic, expanding waistline, and alarming hitability makes him one of the most overpaid players in baseball. (He's getting $12 million a year for the next two seasons.) 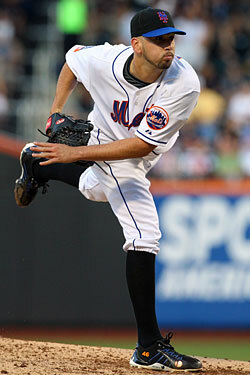 He had a 6.82 ERA last year before having knee surgery, a procedure that came as a relief to everybody. Perez has had a somewhat tolerable spring, showing more resilience than old fastball form. The Mets obviously made a mistake with the three-year deal they gave to Perez before last season, so the most they can hope for, at this point, is for him to throw 180 innings or so of league-average ball. That wouldn't be worth $12 million a year, but it'd be worth a lot more than 6.82 in 66 innings like last year. The amount the Mets improve this season might be directly proportional to how much you're able to stand looking at Oliver Perez — though the Mets have to think the best result would have been never having to look at it at all.